If you are looking for coloring books for your vehicle fan try vehicle historical coloring books. 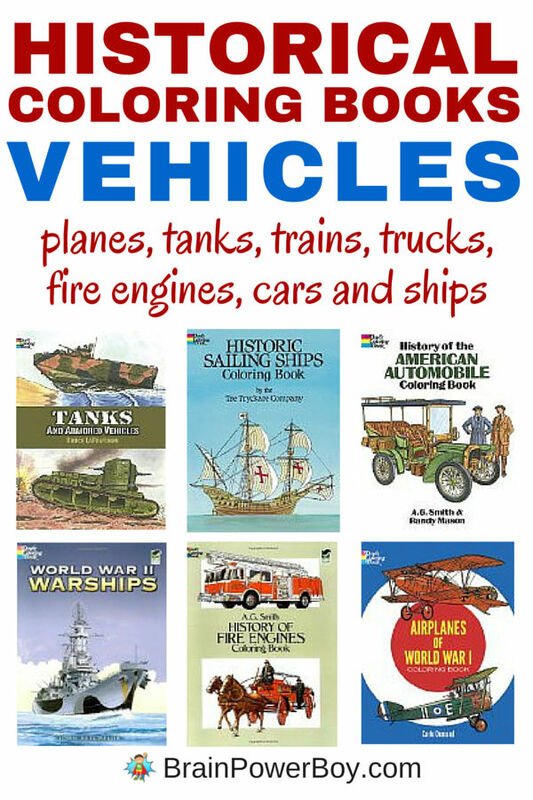 There are coloring books on airplanes, tanks, warships, trains, trucks, fire engines, cars and ships. That ought to keep them happy. What I really like about these is that they will learn something while relaxing and coloring. We own some of these and I have been very impressed with the quality of these inexpensive books. Although these are coloring books, I am adding them to our best books for boys list because they fit there the best and because they really are interesting books with a lot of great historical information in them. Try a few of these wonderful coloring books. They are an enjoyable way to get a bit of history into your days. Airplanes of World War I Features authentic, accurate drawings of the planes in WWI including Red Barron’s Fokker Triplane, Rickenbacker’s Nieuport, the Sopwith Camel, Spad S. XIII, and others. Airplanes of the Second World War Renderings of fighters, bombers, transports, including “Enola Gay,” Japanese Zero, British Spitfire, German Komet jet fighter, many others. History of Flight Coloring Book Includes accurate line drawings of 18th-century balloons, 19th-century dirigibles, the Wright Flyer, the first English Channel crossing, the Spirit of St. Louis, many fighters, bombers, and rockets from World Wars I and II, jets, early space vehicles, the Concorde, and, of course, the Space Shuttle. 47 black-and-white illustrations. Tanks and Armored Vehicles Goes through the history of tanks and other armored vehicles. Famous Trains Coloring pages depict the interiors and exteriors famous trains. History of Trucks From big rigs to other service vehicles such as pickups, tractor-trailers, logging trucks, tankers, much more Captions. History of Fire Engines Vehicles spanning more than 300 years! History of the American Automobile Classic autos, including historic Roper steam carriage (1865), Ford Model A. Runabout (1903), Ford Model T touring car (1909), Studebaker Starlight Coupe (1951), Chevrolet Bel Air hardtop (1955), Ford Mustang convertible (1965). Historic Sailing Ships Thirty-four historic sailing ships rendered for coloring. From Phoenician war galley to clipper Cutty Sark, full-page drawings. Captions. Shipwrecks and Sunken Treasures includes an ancient Greek shipwreck; a Roman merchant ship; Viking ship; a German U-boat; the sunken Titanic; and historic diving suits, scuba-diving equipment, and more. American Sailing Ships Coloring Book Spans over 200 years of maritime history and covers vessels ranging from small, shallow-draft topsail schooners of Colonial times, to sail-and-steam powered ships to modern reconstructions of classic 17th-century vessels. The Titanic Coloring Book Re-creates the “unsinkable’s” journey including details of the ship and crew, the ship running into the iceburg and survivors in lifeboats. World War II Warships shows warships deployed in the Atlantic and Pacific Oceans during World War II. Includes the the ill-fated PT-109, commanded by a young John F. Kennedy; German U-boats; the USS Hornet; and the USS Missouri. Seriously, for the price, these are great books. I plan to add more as we get into different segments of history. The information retained from using them is really surprising. Aw – thanks much Erin. I certainly appreciate it. This is part of a little series of three posts on these types of books. Be sure to watch for the others!